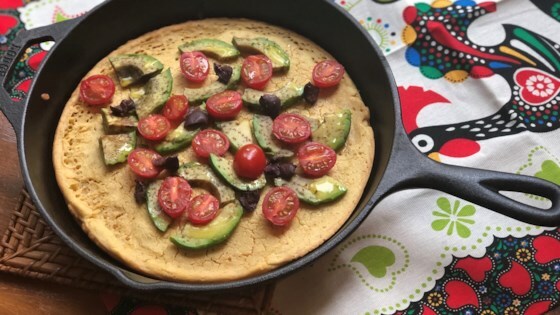 "This grain-free, gluten-free, and vegan Italian flatbread, topped with avocado, tomatoes, and black olives is so delicious and will cure any pizza cravings." Combine chickpea flour, water, 1 tablespoon olive oil, garlic powder, onion powder, Italian seasoning, salt, and pepper in bowl; whisk until smooth. Let sit for 15 minutes. Heat a cast iron skillet over medium heat. Add 1 tablespoon olive oil and swirl around to coat skillet. Pour batter into skillet and cook until edges are golden, about 2 minutes. Place skillet in the preheated oven and bake until socca is set, about 12 minutes. Remove from the oven and top with avocado, tomato, and black olives. Drizzle with remaining 1 tablespoon olive oil. Return to the oven and bake until golden and crispy, about 5 minutes.